stickman's corral: The "call on OPEC"
Reading through some of those Wikileaks' cables from last week on how Saudi Arabia has been... uh... massaging the true extent of their remaining oil reserves, I was reminded of something dubbed the "call on OPEC". 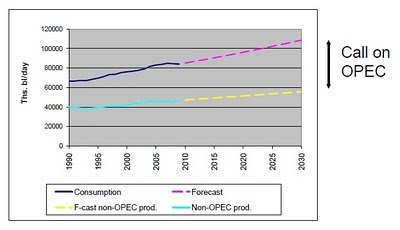 Using a very basic forecast as per the above - where the projection is simply an extrapolation of average growth rates since 1990 - we can generate a rough estimate of what the "call" on OPEC will be in 2030. 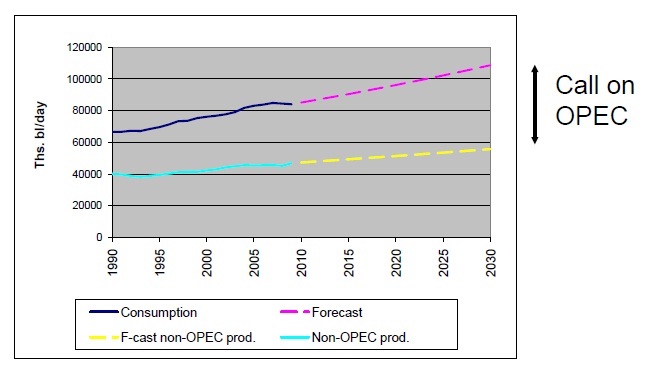 Under these assumptions, OPEC production will have to grow by around 2.3% per year if it is to meet the shortfall in future global energy demand. Bottom line: OPEC will have to supply an ever-increasing portion of the world's oil. Taking the above figures as gospel, the implied call on OPEC requires it to increase annual output by 1.8% a year to meet the forecast shortfall in global supply by 2030. Again, the take-home message is that OPEC will almost certainly be expected to supply an increasingly large portion of the world's oil needs. Is OPEC interested? Is it even capable? There are various reasons to dispute that they are in either case. For one thing, domestic demand for oil in OPEC member countries continues to rise along with their increasing incomes. Why not keep the oil for themselves? Further, in an environment of rising oil prices, there might be strong incentive to leave reserves in the ground so as to take advantage of higher prices in the future. And now, to really complicate matters, is the possibility that OPEC's principle member, the Kingdom of Saudi Arabia, has been systematically overstating its reserves. It would be remiss of us not to ask whether other members of the cartel have also been overly generous in their estimations of their reserves. 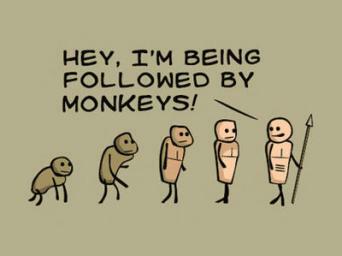 Whatever the case, the world is going to need more fuel than it can easily obtain. Barring some very significant breakthroughs in tar-sand recovery or deep-sea drilling, I wouldn't be putting money on a low oil price any time soon. The inability to meet the expected “call on OPEC” and the higher prices resulting from shortages will create excellent opportunities for international oil companies, independent producers, and private-equity investors. It will also create an opportunity for other energy sources to fill the gap that OPEC members were expected to fill but did not. Indeed, given the expected growth in energy demand in the next two decades, and the possible – even likely – shortfall in OPEC supply relative to the projected “call on OPEC,” the term “alternative energy” will lose its meaning. The only “alternative” to harnessing all feasible energy sources will be a slow-growth world of permanent shortages and increasing misery.